My baby turns three today, and I’ll be 48 tomorrow. Still not pregnant, I’m having to reconcile myself to the idea that this little one may well be my last… and that those precious, fleeting days of breastfeeding may all be behind me (sniff sniff). But while they’re still fresh on my mind, I’d like to share some of the things my babies and I enjoyed most about those sweet times of togetherness. If you’ve been nursing for long, you’ve likely discovered many of these joys for yourself, but it took me several babies before I learned how to really milk the breastfeeding experience for all it’s worth (pardon the pun). Use those close times of breastfeeding to study her velvet lashes, her chubby cheeks, her contented smile. Drink in every tiny detail of your baby as she drinks you in. She won’t be little for long, so memorize each feature while you have the opportunity to do so. Breastfeeding a baby always filled my heart to overflowing with gratitude to God for placing another little one in my care, so prayer has become a natural outflow to nursing. Pray for your baby’s physical health and protection. Pray for her character development and her spiritual growth. Pray that God would bring her to faith at an early age and would keep her foot on that straight and narrow path throughout her life. Pray that she would enjoy a close relationship to her parents and any siblings. Pray for her future spouse. Pray that God would grant you the wisdom and patience and grace and strength and unflagging energy that you’ll need to mother in a way that pleases and honors Him. Serenade her with standard lullabies or with songs you make up yourself. Sing scripture songs to her and hymns rich in doctrine. Sing silly songs and lyrics that have her name in them. Several of my babies liked to hum while they ate, and I found if I hummed two or three notes in succession, they would match my pitch. I’d start by humming middle C until the baby joined me on the same note, then I’d proceed slowly up the scale. After a few days of matching single notes, I’d try singing intervals. My last few babies loved this game, learned quickly, and have continued to demonstrate a love and aptitude for music even as they’ve grown older. Look deep into her eyes and tell her how much you love her and how glad you are that she is and your family. Call her name from one side and then the other, teaching her to track your voice. (My firstborn would invariably unlatch every time I tried this, but the rest of my babies would follow only with their eyes, so we could play the game without interrupting their nursing). Pet her silky soft hair, but don’t stop there. Using long and smooth, but firm strokes, rub her from the top of her head all the way down to the tips of her toes. Baby massage is a great way to stimulate your baby’s nervous system, and it provides myriad other health and developmental benefits for both you and your baby, as well. Count her eyes. Count her ears. Count her fingers and toes. Count the buttons on her blouse or the flowers on her dress or the snaps on her pajamas. Count anything and everything you see, and keep on counting. When it’s time for her to learn math later on, the numbers will feel like old familiar friends. , and Bill Martin, Jr.
. Or if that proves to be too big a distraction while she’s nursing, read poetry aloud. Or Bible stories. Or the newspaper. Children whose parents read to them are more likely to succeed, so start setting the example early, while baby’s still at your breast, and keep it up until she’s grown and gone (which happens so much sooner than you think). Ask her lots of questions (and lavish her with praise when she answers correctly): Where are your eyes? Where are your ears? Can you point to your nose? Can you wiggle your fingers? Can you clap your hands? Depending on how long you breastfeed (the American Academy of Pediatrics recommends continuing for at least 12 months; the World Health Organization for 2 years), this game can be expanded to include all sorts of information. By 12-18 months, several of our babies could even identify their clavicles, phalanges, vertebrae, and patella. The sky is the limit! Of course, when they are extremely new, babies will not stay awake for much of this, but that is a-okay. They need their rest (and so do you), so use those first few days and weeks to sleep when your baby sleeps (some of the best advice I was given as a new mother). This is a great way to rest and replenish your energy as you cuddle and bond with your baby. My husband and I have always kept our little ones in bed between us for the first few months. Bedsharing makes nighttime feedings so much more convenient for Mom, who can tend to a hungry infant without getting out of bed or even fully waking up. What’s more, research indicates that co-sleeping is good for baby and may even protect against SIDS. To be sure, there are other things you can do while breastfeeding a baby: I’ve managed to iron clothes, darn socks, tutor math, write books, sew curtains, vacuum floors, change diapers, fold clothes, surf the Internet, backpack Europe, and — in a pinch — even shop for groceries with a baby latched onto me. It’s called multi-tasking, but I don’t know if I’d really recommend it in this instance. Some of those tasks were necessary, to be sure, but from my present vantage point, I feel I may have squandered too many opportunities, especially in my early years of mothering, to simply cuddle and love and breathe in that blessed scent of my babies — babies who, in the blink of an eye, were no longer babies at all. So pay attention while you can, Mama. If you don’t, you may miss the miracle that is unfolding before your eyes, and there will be no going back for a redo. I was able to nurse each of my three boys for 12-13 months. I so LOVED the cuddle, personal time I spent with each one. I did many of the above suggestions. The girls (twins, born pre-term are now 7 months old), I was unable to nurse due to many factors. (I do pump several times a day and have been blessed to supply more than enough to feed them exclusively breastmilk.) I so miss the nursing experience. I also miss the cuddle time. With two infants, I find it very challenging to cuddle one baby while the other is crying for attention. Or when of one the boys (esp the youngest two) need Mommy, too. Never thought of praying! ♥ Definitely going to put down my phone more often & do these. 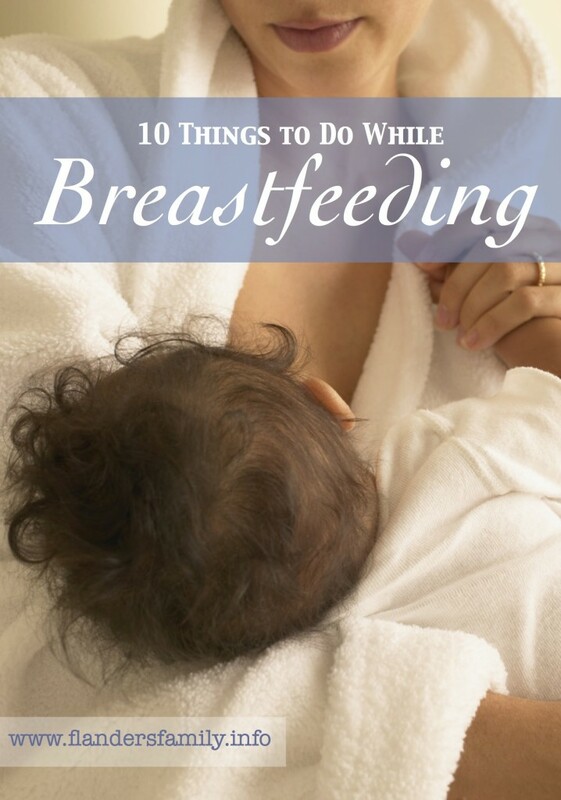 I tend to use Pintrest while breastfeeding often, its my addiction! Thank you! Thank you so much for the reminder of what a treasure babies are. I too often get wrapped up in myself and feel time slipping away. I’m still nursing my second child, and I praise God for this blog I stumbled upon tonight. I teared up and pray I’ll take more time to cherish my two precious children. Thank for for the sweet reminder. I just had my 6th and have always struggled with breast feeding. Before I go on, I would like to add that I have done everything there is to do in order to be successful with nursing, even things most lactation specialists haven’t heard of, yet breast feeding just never works out. This last baby, I stopped VERY early, after only 4weeks and I had such a peace about it, unlike with the other babies. Even though I’m bottle feeding, we have a strong bond, stronger than I’ve had with others. He sleeps with us too and ,yes, at times, I have to multi task while bottle feeding. I say all this to encourage those moms that can’t breast feed and let them know that everything you wrote applies to them too. You are absolutely right, Corrine! I had a terrible time nursing my seventh child. She had trouble latching on, and even with a supplemental nursing system that supplied extra milk through a tiny tube as she breastfed, it still took her eight weeks to regain her birthweight. Once she received her first bottle of formula at two months, she never nursed again. Excellent advice for moms–babies grow up so quickly! I’m visiting from Women Helping Women. I am nursing my 9th to sleep as i read this. Thank you for all your posts and your book. They have been such a blessing. I love doing all that you mentioned here with my babies. It truly does go by fast and even though i know i have many years to go, i take in every moment it and cherish every bit of it. Many blessings on you and your family!